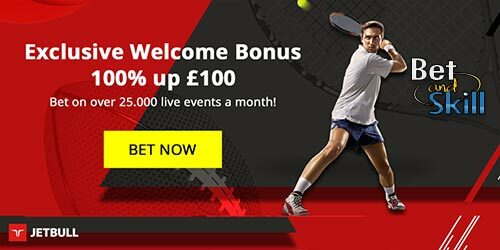 Jetbull Betting Bonus: 100% up to £100 (Exclusive)! New to Jetbull Sports? We have an exclusive and enhanced welcome bonus for you! Join today and when you make your first deposit, Jetbull will add a 100% of the deposited amount up to £100 (or currency equivalent) to your account! Standard bonus is only 50% up to £75! By opening a new Jetbull account, you can enjoy unlimited betting around the clock on hundreds of different sports via your desktop, tablet or mobile. You can also bet in-play on over 25,000 live events every month. If you like online casino, Jetbull is also offering over +1,600 types of Casino & Live Casino games! 4. Bet on sports with double the money! 100% up to £100 or currency equivalent! 1. This promotion is exclusive for the customers registered at Jetbull.com through this page. 2. The 100% Sports Welcome Bonus up to £100 (or currency equivalent) is available to new Jetbull customers only. 6. The total amount held as bonus funds must be wagered 10 times (10x) with all bets settled, before the bonus funds and qualifying deposit amount are released to the customer's real money balance. Example: customer makes deposit of £100 and receives the full bonus amount of £100. Qualifying deposit amount of £100 + bonus funds of £100 = £200. £200 must be wagered 10 times (10x) before the bonus funds and qualifying deposit amount are released to the customer’s real money balance. "Jetbull Betting Bonus: 100% up to £100 (Exclusive)!"